Don't bite a lite......bite a Lite bite! Fibre optic wand bends and directs light where no ordinary flashlight can reach, providing precise illumination of the smallest work areas. Transform your Mini Mag-Lite AA into a precise lighting instrument. 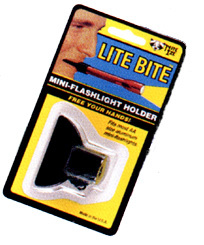 Code # 001 Mini Mag-Lite AA 7" Bend-A-Beam £7.50 ea. Code # 002 Mini Mag-Lite AAA 4 1/2" Bend-A-Beam £6.50 ea. Code # 003 Mini Mag-Lite AA 20" Bend-A-Beam £11.00 ea. Code # 004 Mini Mag-Lite AAA 20" Bend-A-Beam £11.00 ea.